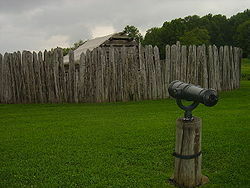 The Battle of Fort Necessity, or the Battle of the Great Meadows took place on July 3, 1754 in what is now the mountaintop hamlet of Farmington in Fayette County, Pennsylvania. 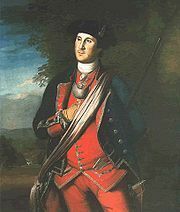 The engagement was one of the first battles of the French and Indian War and George Washington's only military surrender. The battle, along with the May 28 Battle of Jumonville Glen, contributed to a series of military escalations that resulted in the global Seven Years' War. Following the massacre, Washington pulled back several miles and established Fort Necessity, which the French then attacked on July 3. The engagement led to Washington's surrender; he negotiated a withdrawal under arms. One of Washington's men reported that the French force was accompanied by Shawnee, Delaware, and Mingo—just those Tanaghrisson was seeking to influence.